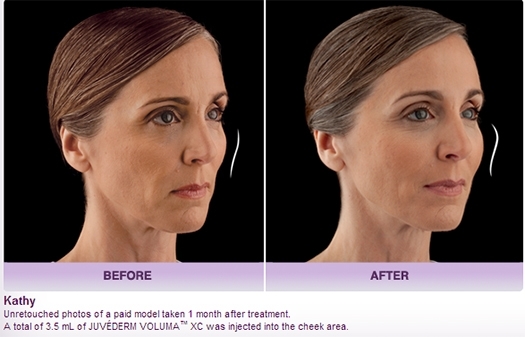 Juvéderm Voluma™ XC is the latest in the Juvéderm line of injectable fillers. It is formulated to counteract signs of aging by adding volume to the cheek. Juvéderm Voluma™ XC lifts and contours, leaving a more youthful appearance. Juvéderm Voluma XC treats sagging skin and volume loss in the apex, apple, and hollow of the cheeks. Voluma XC is the first and only FDA-approved filler for adding volume to the cheek area. Juvéderm Voluma XC is an injectable filler made from modified hyaluronic acid, a substance that is naturally produced by the body. It adds volume, and helps the skin retain moisture and softness. During treatments, Dr. Narins injects the formula beneath the skin’s surface of the cheek and midface area. There is little to no downtime after the treatment and results can last up to 2 years. Board-certified dermatologist Dr. Rhoda Narins served as a principal investigator during clinical trials for Juvéderm Voluma™ XC and is the only expert in this area recognized by Allergan, the manufacturers of Voluma.